Sense of community and related aspects of social support are a part of a playerâ€™s experience in social gaming. Rather than encouraging solitary game play, as was the case with the early digital games, interactive games now offer new ways for individuals to connect. Why Sense of Community Research? 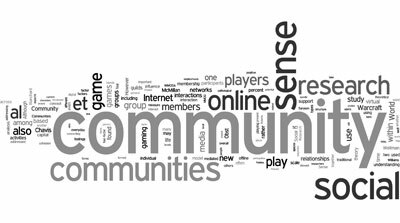 Comments Off on Why Sense of Community Research? Research has found that higher levels of sense of community are related to higher levels of mental health, physical health, and economic prosperity and can impact social justice and change. Sense of community is central to understanding communities and their impact on members.